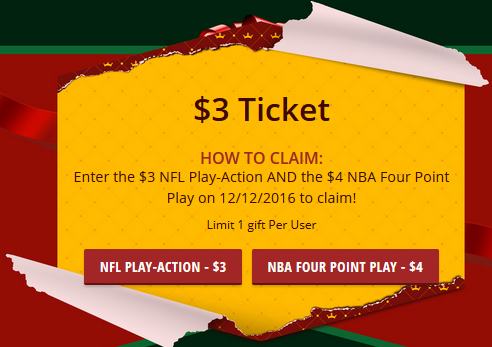 DraftKings has 12 Days of 2016 Christmas Gifts for playing your favorite Fantasy Contests……. Each day starting on December 12th, 2016 DraftKings will offer a gift, just for following the contest play challenges for that day. 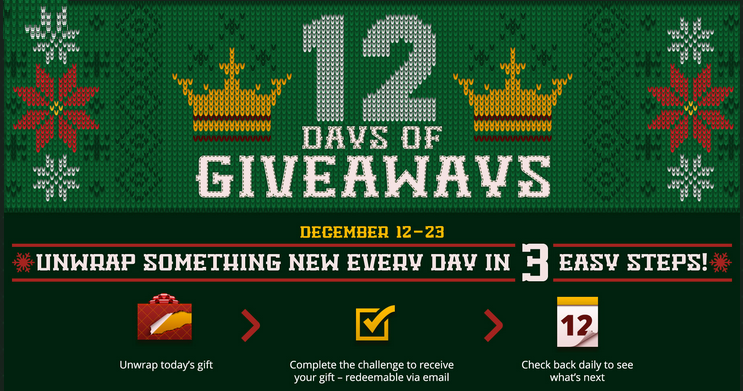 Just go to the DraftKings main lobby and click “Unwrap Gift” to see the challenge and the gift for that day. The daily gifts will include free contest tickets, free play contests, DK Dollars, DraftKings Swag and much more (ticket packs for completing 2 of the 3, December 21st, 22nd and 23rd Gifts). Challenges include entering specific contests each day. You do not have to complete each challenge every day, just the challenges in the individual sports you want to play. Play within your limits and on the sports you know best. Daily Gifts are awarded for each completed challenge. Just visit the DraftKings Main Contest Lobby each day to see what your challenge and gift could be…. From Dec. 12th thru Dec. 18th at 1PM ET, Get $20 in DK Dollars absolutely free when you Join DraftKings and make any size new deposit. That’s a $20 instant Deposit BONUS to claim for yourself today. 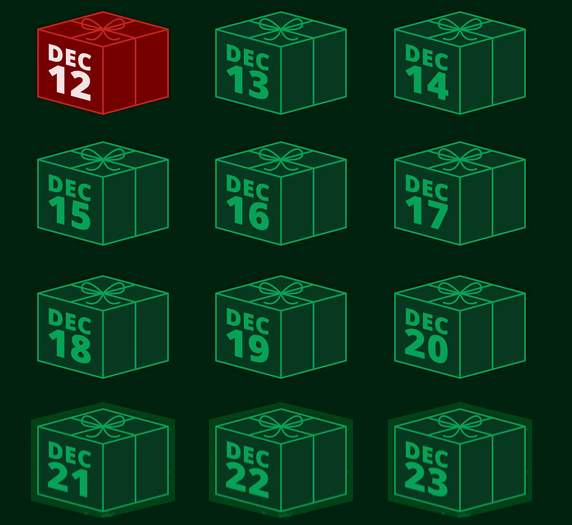 You can track your progress daily and open your gift by clicking the 12 Days of Christmas on the promotions tab and clicking the gift box for that day. There you’ll see what gifts you have already collected. The Last 3 Days of Giveaways is Cumulative – Enter 2 out of 3 days to Unwrap a Super Gift! How can I qualify to receive a daily prize? Click “unwrap gift” on the 12 Days of Giveaways promotion page and complete that day’s challenge. Do I qualify for a prize if I enter a contest with a ticket? All digital prizes (FPPs, tickets, DraftKings Dollars, etc. – update) won during the 12 Days of Giveaways will be delivered via email the following business day by 5PM EST unless otherwise noted. For all physical prizes, a DraftKings representative will reach out to all winners within 24 hours after the contest to confirm shipping information. For users who complete two (2) of the three (3) listed challenges from Wednesday, December 21st through Friday, December 23rd, ticket packs will be delivered via email the evening of Friday, December 23rd. When will the next daily challenge be available? Each daily challenge will be unveiled the day of at 12am ET. Do I need to enter contests through the 12 Days of Giveaways promotion page? No. Once you’ve clicked “unwrap gift,” you can enter that day’s contest from anywhere. How will I know if I successfully completed today’s challenge? Complete all of the criteria, for each respective day, listed on the 12 Days of Giveaways promotion page. Once the day has concluded, all qualifying users will be sent an email confirming their prize the following day. I already completed today’s task. Can I still get a prize? Yes. By clicking “unwrap gift” you’ve already qualified. If I complete today’s challenge multiple times can I win multiple prizes? No. All users are only eligible to win each day’s gift once unless otherwise noted. DraftKings is giving you a chance for some Great Free Gifts, just for doing something you enjoy doing every day when playing daily fantasy on DK.